This week-long special summer itinerary involves a spectacular 2-day trail with a night's camping where you will be served a 3 course meal on top of the world! Suitable for all levels, though a certain degree of stamina is required. Arrive at Spoleto train station and 20-minute transfer to stables, where you can settle in and wander around to see the horses. Dinner and overnight. 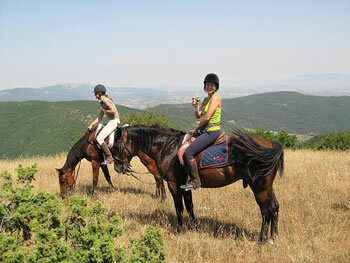 Your riding holiday starts off in a fairly leisurely way on the first day, to give riders the chance to get to know their horses. We pass through shady paths among the chestnut woods and you'll have time to admire the magnificent gnarled old trees which have supplied chestnuts to generations of people living in this area, and to spot the wild cyclamen and other flowers that grow in the woods, before climbing steeply up into the foothills of Mount Acetella, today's destination. There are plenty of chances to trot or canter along these paths, but don't forget to stop and take stock of the magnificent views here. You can see high mountain peaks in the distance, with the stables and Montebibico, a mediaeval village where time seems to have stood still nestling in the foreground - a great place for a photograph. Afterwards, we head up to the top of Mount Acetella itself, just a short climb, where you will be rewarded with more stunning views. 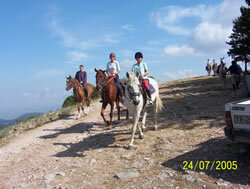 We head back to the stables via another series of trails for lunch. 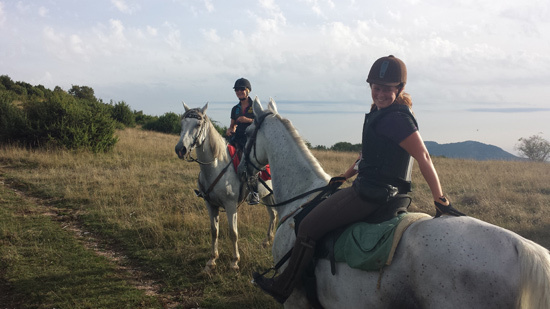 Today the serious riding begins, as we set out on the first leg of a two-day trail that will take in some exquisite Roman ruins, a 13th century monastery founded by St. Francis himself and a three-course dinner on top of the world. It will be a long ride, but there will be plenty of stops and some unforgettable sights along the way. 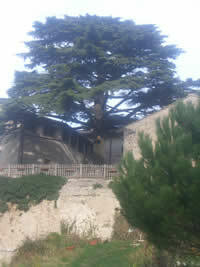 We set off through chestnut woods, past the village of Montebibico, and up into the foothills of Mount Acetella. From here, we can see the final goal - the Martani mountain range, famous for its fossils. 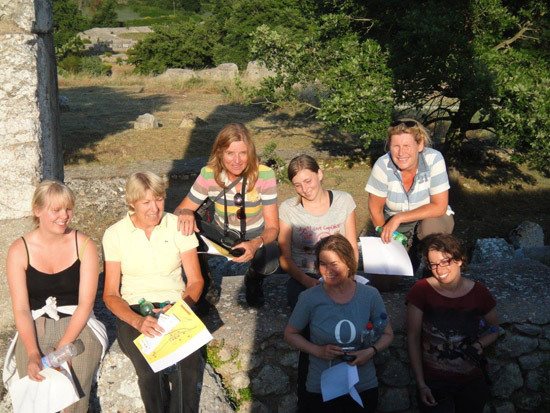 We wind down through trails to the village of Giuncano and climb up again through oak woods to Torre Maggiore, a magnificent setting, with 360 degree views. Here, we water the horses and stop for a picnic lunch in a forest glade. After a 2-hour break, it's time to resaddle and begin the 1.5 hour trek along the crest of the mountains to Carsulae. This ancient Roman settlement is in a dramatic setting perched on the mountainside, with none of the crowds you get in Rome. 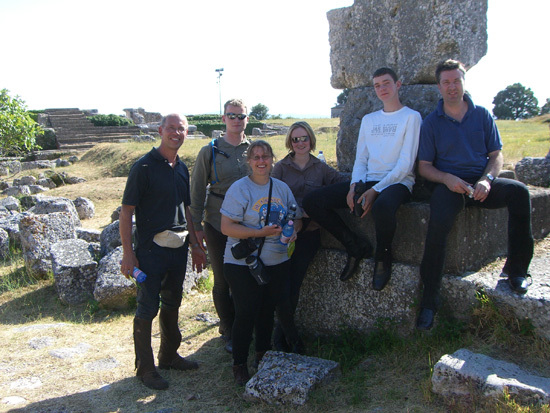 There will be plenty of time to visit the well preserved amphiteatre and walk along the ancient Flaminian Way, complete with runnels carved by chariots in the flagstones. We can also stop for a drink at the bar. 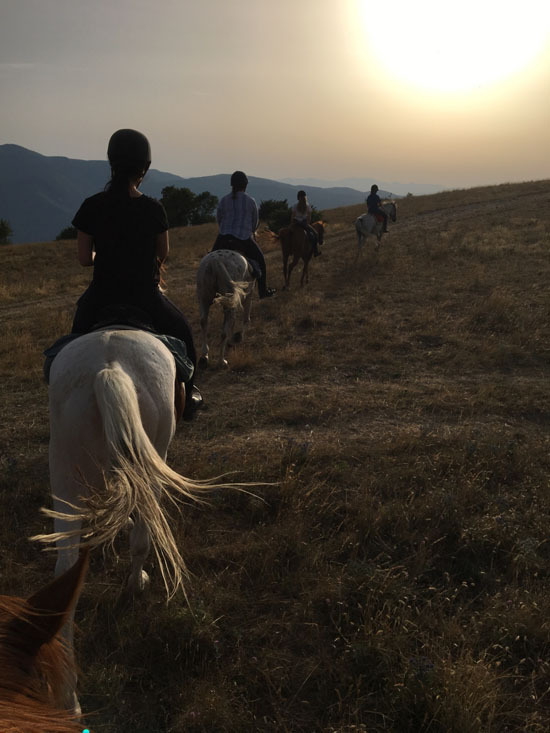 We ride back to Torre Maggiore, and settle the horses in before sitting down to a delicious three-course dinner served at the table, with coffee taken around a campfire. Those who wish can camp the night, with tents and equipment provided. But anyone wanting a hot shower and a real bed will be driven by jeep back to the stables (35 mins) and brought back again after breakfast the following morning. After breakfast, if time permits, we take a trail to a beautiful Franciscan monastery, l'Eremita degli Arnolfi (Arnolfi Hermitage), founded by St. Francis and now restored to some of its former glory. From there, we set off along mountain trails to the pretty village of Macerino, nestling among the woods. A substantial cooked al fresco lunch, with wine, will be served at table in the shady grounds of a stunningly pretty Romanesque church, the Madonna di Panico. There will be time for a rest before resaddling and riding through trails, then clattering through the picturesque village of Castagnacupa, whose old stone houses have all been recently restored. From here, we head along wide mountain paths to the village of Catinelli, precariously poised on an outcrop. 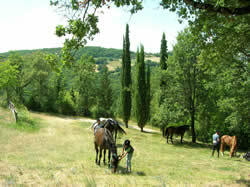 The stables are within sight now, an hour's ride past the village of Montebibico and back through the chestnut woods. There will be plenty of time for a good hot shower before dinner, prepared in the clubhouse, by the stables' very capable cooks. Today, we take things a bit easier with a half-day ride up into the mountains which you can see from your chalets. 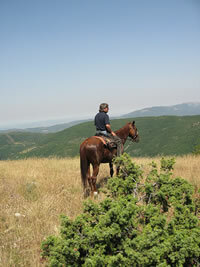 The pace is mixed, according to terrain and abilities, but there is plenty of scope for a canter for those who want to. From the stables, we pass through chestnut woods to Montebibico, following a series of trails which wind gently past small farms and up into the foothills of Mount Acetella. Up on top of the mountain there are splendid views of Spoleto, with its 13th century viaduct and ancient castle. On a clear day, you can see right up the valley as far as Assisi. There will be time for photographs or a short stop before we begin our descent down another set of paths back to the stables for lunch. This morning we set off on a full-day ride, along a path that will take us past a pretty country church to the village of Torrecolla, and from there along wide trails where there is good scope for trotting or cantering. 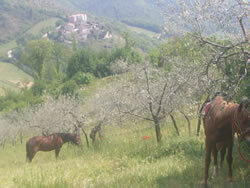 We turn off to ride through the village of Casigliano before we clatter through the picturesque village of Strettura. A series of trails takes us up to the place where we will have lunch today - the grounds of an old house overlooking mountains and valleys, where a long table will be set and a hearty lunch served to hungry riders. In Spring, this is a terrific place for picking the wild asparagus which grow on the hillsides here. On the way back, we pass by the church of San Pietro Martire, a tiny chapel in the middle of nowhere, still used to this day by some of the outlying villages. 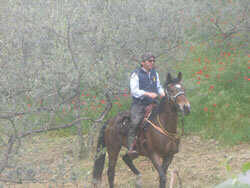 From there, we ride through the woods to the village of Acqualacastagna and back to the stables. Today's final half-day ride takes us through the grounds of a magnificent 600-hectare private estate called La Tenuta dello Schioppo, but known locally as Il Parco delle Farfalle, the Butterfly Park. There are wide avenues perfect for trotting or cantering, and splendid views of mountains, valleys and hill villages in all directions. In a woodland glade a huntsman's table has been fashioned out of local chestnut wood, and this will be the stopping place for an aperitif. In May and June, these woods are carpeted with tiny wild strawberries. We ride back for lunch at the clubhouse, with a free afternoon to relax or go exploring in nearby Spoleto (transport can be provided at reasonable cost) before meeting in the clubhouse for a drink and farewell dinner. In warmer months, and in times of a full (or nearly full) moon, it may be possible to replace a full day ride with a memorable Night Ride up onto the mountain of Monte Acetella. 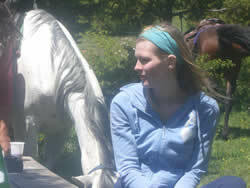 Riders are met by the stables' jeep, and served a camp-fire supper as they scan the skies for shooting stars. The return leg of the journey takes place by the light of the moon.